New drivers may want a car that’s luxurious or sporty, but if that new driver is a teen, parents should prioritize safety and reliability when shopping for their new ride. Handing over the keys to a 16-year-old understandably creates a lot of anxiety for Mom and Dad. Inexperience makes young drivers more likely to be involved in a crash. According to the Center for Disease Control and Prevention, six teens (aged 16 to 19) die every day from motor vehicle injuries. A recent study by Liberty Mutual found that two thirds of teens say using music apps while driving is dangerous, but nearly half still admitted to using them behind the wheel. Adding to that, Half of teen drivers admit to texting while driving, according to a study by AAA. When teens are searching for their favorite song or talking with friends, they’re not paying attention to the road, and the consequences could be severe. An inexperienced driver needs all the help they can get to stay safe on the roads, and that’s where crash protection comes into play. If you want to know the best cars on the market for crash protection, the U.S. News & World Report recently compiled a list of All of the Best Cars for Teens. Every car on this list has excellent safety ratings from the Insurance Institute for Highway Safety and the National Highway Traffic Safety Administration. To qualify for an IIHS Top Safety Pick, vehicles must earn good ratings in five crashworthiness tests — driver-side small overlap front, moderate overlap front, side, roof strength and head restraints — as well as an advanced or superior rating in the full front crash prevention tests. Along with high IIHS and NHTSA safety ratings, the best new cars for teens have the best combination of overall quality, predicted reliability, and accident-avoidance technologies. They may not be the flashiest picks in their respective car classes, but they will help keep your teenager safe and keep you happy. The 2017 Hyundai Elantra was named Best New Car for Teens in the $25K – $30K price range! Pick up a 2017 top-of-the-line Elantra Limited and you can get a full suite of accident prevention technology including blind spot detection, lane keep assist, and forward automatic braking with pedestrian detection, along with extra safety goodies like adaptive cruise control and a rear-view camera. 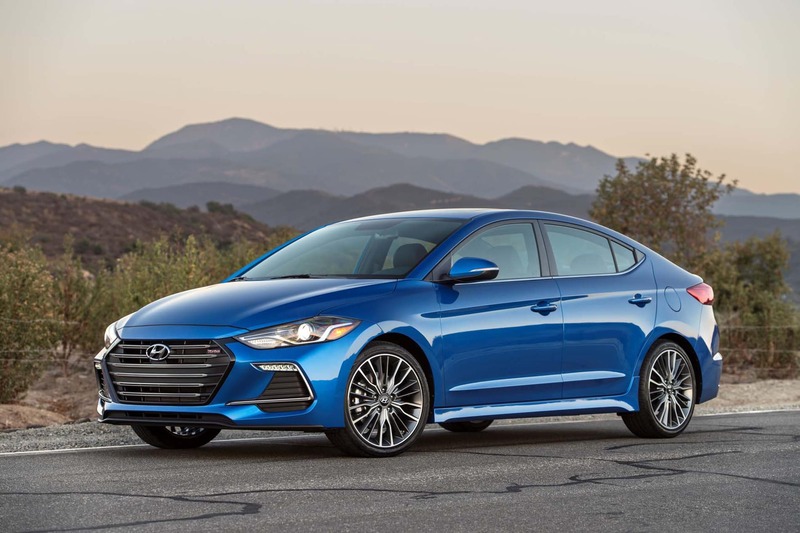 Plus, with Hyundai’s Blue Link system, parents can get notifications sent to their phones if their teen keeps the Elantra out past a certain time of night. You can also get notifications if the car ever exceeds any speed or geographic boundaries you have set. And The Elantra’s predicted reliability is among the best of any new car in the compact car class, so you can rest assured your teen’s Elantra will last them a long time. While a new vehicle for your teen isn’t always as budget-friendly as a used one, the more abundant and advanced safety technologies in newer cars could help prevent an accident, making a new set of wheels well worth it. Let us find you a great new Hyundai so you can have total peace of mind with your teen behind the wheel!